if it were not for their church. It did not give us the Bible. God did! The Roman Catholic Church did not begin with Christ and the Apostles. In ancient times Christ’s church did come to be known as the “Catholic Church”. However, this Catholic Church is not the Roman Catholic Church. The Roman church falsely usurped this title for itself. There are a number of churches that call themselves catholic and all claim successorship to Saint Peter who, consequently, had no successors to his apostleship. Though bishops inevitably get replaced, the call of Peter was unique. Christ’s catholic church is built on Christ Himself as God. The Roman Catholic church’s claim is that it is built upon man, namely Simon Peter. The word “catholic” is from the Greek word “katholikos” which means “universal”. Christ’s church is His body, which is everyone who places trusting faith in God solely through Him for salvation. Christ’s church is above and despite denomination. 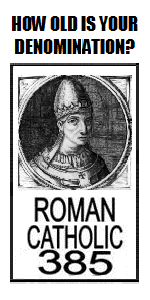 The Roman Catholic Church came into existence in the late 4th century long after the Council of Nicea. The Roman Catholic Church neither invented nor created the Holy Bible. The books of the Holy Bible were well recognized in ancient days as we can well see from early church quotations in Ante-Nicene fathers’ writings. The Council of Nice did not pick and choose which books would or would not go into the Bible. They simply and publicly testified what books were already recognized by Christ’s universal church, having a great consensus among themselves. The later Roman Catholic Church only gathered the manuscripts. The giving out of Bibles has been done, not so much by the Roman church, but by Protestants, Baptists, and other Christians of Christ’s catholic universal church. Rather, the Roman Church has said, “Don’t read the Bible. We will teach it to you.” Unless the Roman Catholic Church has actually handed you a Bible, then in no way did it give you the Bible. God gave us His word, the Holy Bible. The Holy Scriptures are God’s word. He is the true author of His word, not the Roman church. Also, please do understand that there is Biblical proof for Sola Scriptura. Furthermore, do not be made unaware that Jesus Himself denied the Apocrypha as inspired.